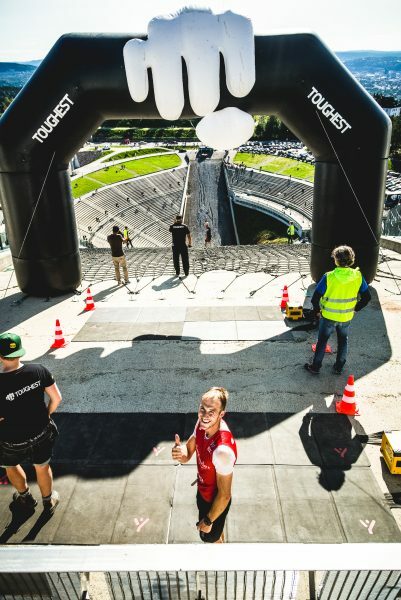 Toughest Oslo is always one of the obstacle racing highlights of the year. 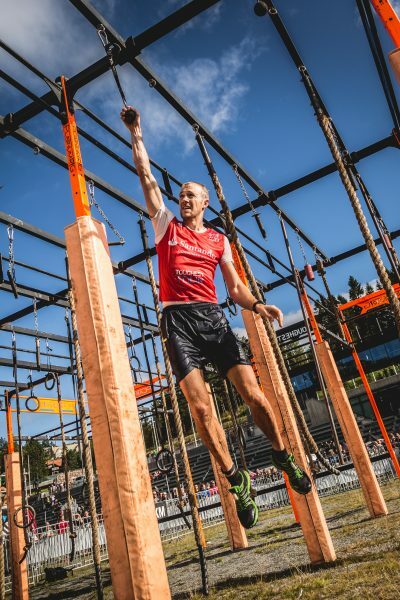 There aren’t too many obstacle races in Norway so when Toughest arrive at Holmenkollen there always seems to be an extra amount of excitement in the air. 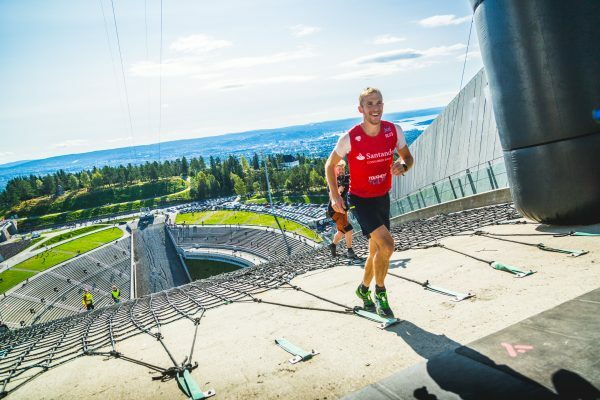 Holmenkollen is an excellent venue for an OCR with a good amount of mixed terrain and hills. One hill in particular is rather special and that’s the ski jump itself, this is the last obstacle of the race with the finish line on top! Creating over 2 minutes of lactic burn before finally crawling over the line it certainly is a special finish. 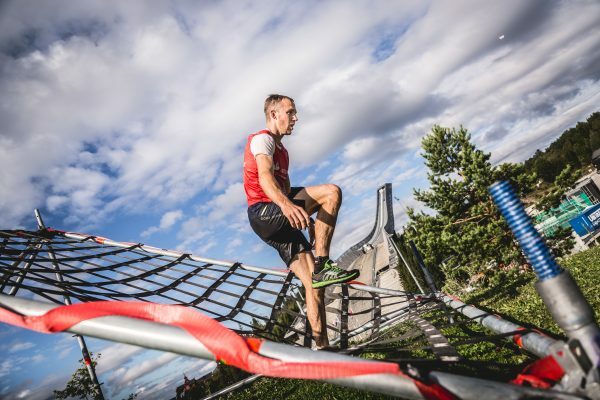 With mainly ultra mountain races during the summer I was interested to find out how I would fare on this comparably short 8km obstacle race. Toughest races are one of the most intense around and would be a far cry from 7 hours running in the mountains. Obviously having not lost a Toughest race before, I was as focused as ever to execute this one to the best of my ability. Santander had kindly lumped a little more pressure onto my back by promising to match any prize money I won and give it to our charity partner, Right to Play. So. with a few good reasons to reach the top of the ski jump first we were off and as usual off in a speed that was far too fast for an 8km course with 40 obstacles, especially as from the start we head immediately uphill. I tried to save a little gas in the legs holding back in around 5th. I knew there were uphill hay bales coming which can turn fresh legs hollow, let alone those that have just near out sprinted 600m uphill. The plan worked and by the top of the bales I was in first with still a little gas to give once the course flattened out. A narrow section of trail made me glad I had timed the start well but it looked like there were still some people to fight with just behind. I checked back and was surprised to not see one of the usual faces behind me, it was someone in a “wildcard” bib as opposed to a sponsored team. He proceeded to shadow me through the sandbag carry, big wall, net climb, dragon back and ring slide. A few questions started rolling through my mind like… Who was this guy? Why do my legs feel hollow and crappy? Is it possible that I am thirsty already after only 1km? Is this going to be a tough race? Coming around to the trampoline jump I tried to get as much distance off the thing as possible to cut down on the amount of swimming. Some seconds after hitting the water I heard another splash. Breast stroking my way along I knew the next section of running would be hard. Cold water like this stiffens up your legs and makes running feel 10 times as hard and 10 times slower than before. After the first swim the first truly hard obstacle was coming up and it would be here that I would find out if anyone could match both a fast running speed and the ability to do the faster, harder, lanes of obstacles. Swinging through the nunchucks of the swing walk and then doing the same through the hard lane of the rig, the course doubled back on itself and I was glad to see a sizeable gap had opened up. Taking the rope climb instead of the salmon ladder I still had quite a lead so began to cruise fast which my legs seemed to enjoy. They were starting to feel better and better and had recovered from the shock of near full pelt running right from the line. Now halfway through I just had to concentrate on not messing up any obstacles and keep a good pace up on the hills. Remaining focused everything went smoothly and I once again found myself in the event centre for the flying monkey and balance beam before beginning the ascent of the ski jump. The ski jump is truly special and never painless but I knew if I put my head down and grinded away it would be over in no time. It would have been far quicker to hike/crawl but like last year I decided to try and jog all the way to the top. The sun was beating down on my neck but I was happy that it wasn’t another competitors breath instead and finally crossed the line in 39 minutes and 25 seconds. 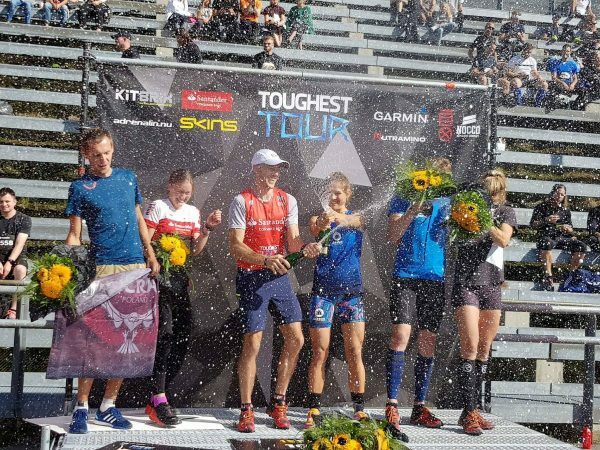 So, with 1000 Euros won for myself and thanks to Santander, a 1000 for Right to Play to send to children in Africa and the Middle East I concluded it was job well done and started to think about my next racing adventure; one of the biggest races of my year and last Skyrace of the season, Glen Coe Skyline in Scotland. Podium photo taken by Agnieszka Bejtka for OCRA Poland. Other pictures are taken by Jacques Holst, licensed under Creative Commons BY-NC-SA 4.0. More works can be found at jacquesholst.com. Great review as always. Nice yo follow your competitions.